Hundreds of baseball-like sea creatures have washed up on a Cornish beach. The small heart-shaped orbs were sea potatoes, a sea urchin that lives buried in sandy and muddy sea beds all around UK coasts. Rosie Hendricks was on the beach at Wherrytown in Penzance earlier with her daughter, sister and nephew when she spotted the "odd-looking" creatures. Ms Hendricks, from Penzance, who had never seen anything like it before, said: "I wasn't sure what they were." There was a similar mass-stranding of the urchins on nearby Long Rock beach in 2016. 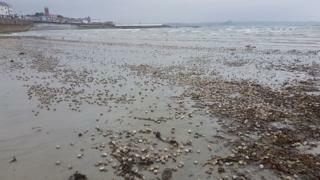 The appearance of the tennis ball-sized animals baffled beachgoers but Plymouth University professor Martin Attrill said mass strandings of sea potatoes were "not unusual". Ms Hendricks said she was aware that a number of urchins had washed up in nearby Longrock two years ago. She said it "must be the time of year". According to the Cornwall Wildlife Trust, the sea potato, which is also known as a heart urchin, lives buried in up to 15cm of sand or muddy sediment. It is the dead animal which often washes up as a brittle, white shell minus the yellow-brown spines.